Still playing around with the new camera, with some guidance from the expert hand of Mr Rice, I'm beginning to learn my way round the new Nikon getting to grips with the astounding things that it seems to be able to do; that's if you know what your doing of course! With the saturation levels whacked right up the Nikon is able to make WA54 OLT look brand new once more, even on such a dull day as today has been. With the saturation at normal levels we see the true colours of the Tridents shine through. The range of colours on a day like this though is quite amazing, my old Canon had no where near the colour range the Nikon is able to achieve. This is probably my favorite photos I've taken so far, depicting A-Line's R651 YCR. The sharpness the Nikon can produce is also completely unrivaled by my old Canon. The whole feel of the camera is completely different, with it just being able to react so much faster. I thought the old S5IS was decent, but it really isn't a patch on what the D5000 is able to produce. And I thought camera technology hadn't moved on; how naive I was! As some of you may already know, I was ‘foolish’ enough to leave my camera on the train on the trip back from Blackpool last week. IT was a tight connection for out train back down to Plymouth at Birmingham New Street, and in my haste, hauling my suitcase etc off the train and up the stairs, I managed to forget the old faithful Canon S5IS. The train was heading for Bournemouth, so alerted Crosscountry, incase it was handed into the train manager, South West Trains, in case it was taken off the train at the end of the line, and First Great Western , incase someone was kind enough to hand it in at the station they were leaving the train at. But alas nothing has materialised, and so she needed replacing. The camera I’ve decided is fit for the job is certainly quite a large step up from the old Canon, to this 2 year old Nikon D5000. As is quite plain to see, this is a ‘proper’ DSLR camera, so its certainly going to take some getting used to before I can start producing some half decent photos, but in time these should be of a far superior quality to the old Canon’s. The camera itself I was extremely lucky to find. This is an Ebay purchase, and although there is of course some risk involved while using Ebay, if you’re careful enough it can certainly come up trumps, as indeed it did with this. My D5000 was previously owned by a professional photographer who used this as his backup camera, and hence, has had extremely little use. The lens itself to fit the body had never been used once as the previous owner simply used his professional lens instead, so I’ve ended up with a practically new camera, for nearly £500 less than what it would have cost when it was brand new. 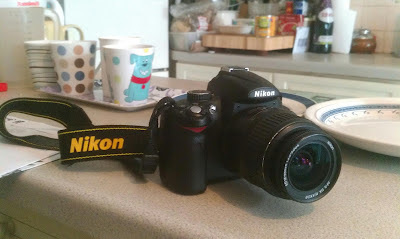 I kid you not, I paid just £280 for the beast, just £30 more than my Canon cost when it was new just over 4 years ago! So it certainly appears I’ve come up trumps. 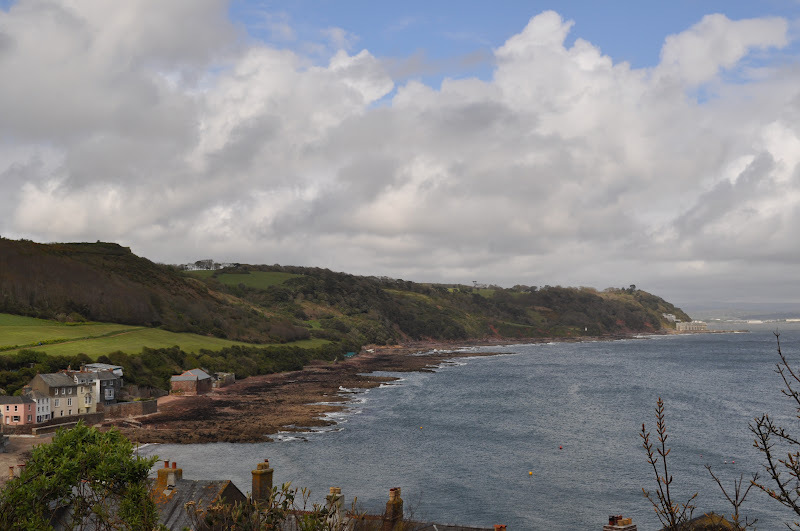 So to kick things off, here’s some inaugural photos taken this afternoon of Cawsand Bay, along with A-Line Vario, R651 YCR. I did ‘try’ to take photos of some other buses passing through, but I missed every single one apart from one in which a car managed to cross my path just at the wrong time! Its certainly going to take some getting used to, this isn’t just a ‘point and shoot’ and you get a nice photo! My apologies first for the lack of blogging this week. My final exams are looming ever closer, reducing my free time hugely at the moment, which has come along at the same time as a spate of illness, very conveniently timed... So I can't promise a huge amount of regular blogging in the near future, but will try to fit one in when I do find a spare moment. Snap on Sunday this week is another picture taken on my 3 day jaunt of the North of England, this time another Leyland Olympian, Ex London D238 FYM, but found in the beautiful city of Chester. 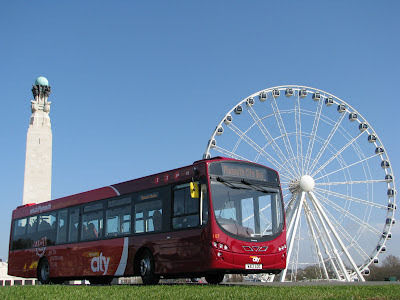 I believe I'm right in saying that the Olympians operating on Chester's City Sightseeing tours are First Group's very last 'proper' Leylands still in use. 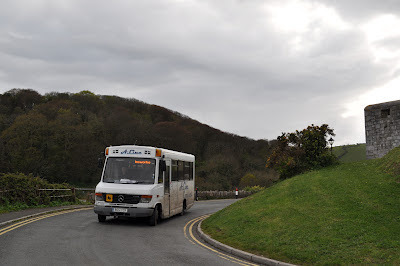 Chester has always seemed to be very fond of the Gardner 6LXB examples, with their final fully closed top Leyland only being retired in August last year, this being the stalwart that was B200 DTU. 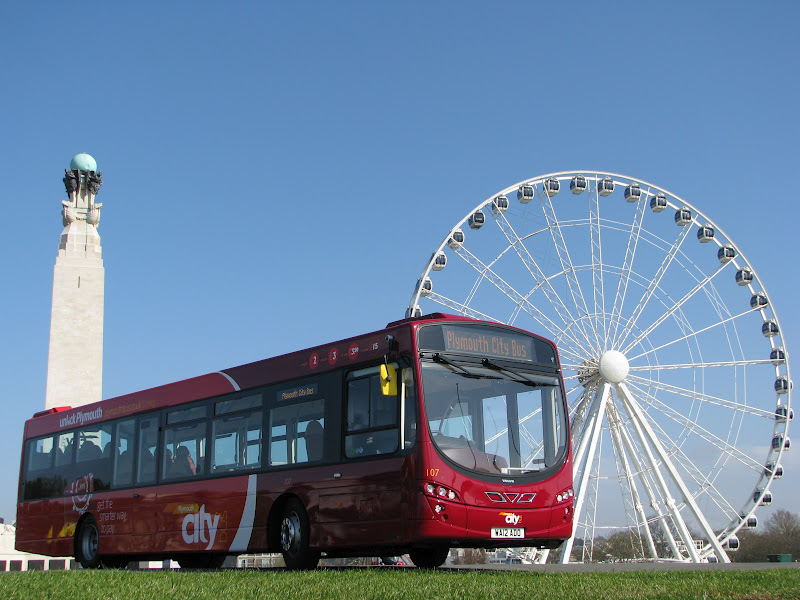 B200 was bought new for Chester Park and Ride duties, and managed to survive her whole 26 years within the city, quite amazing considering she was part of one of the 'big five'. The Snap on Sunday was an outright obvious one for me this week, depicted is the glorious beast that is D367 JJD playing her trade on the 20 to Marton Mere in Blackpool. 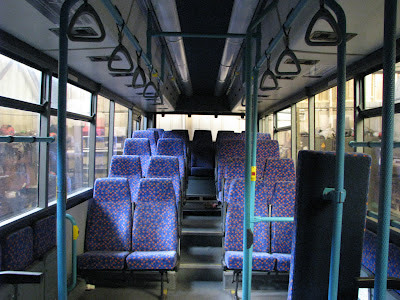 D367's original identity was D263 FUL which some of you may recognise as being the final Leyland Olympian ever to be bodied by ECW, as well as the final vehicle ever produced by ECW before production was transferred to the to Leyland where the old Leyland National factory was then used to body them using the old ECW molding. More on the Blackpool scene later in the week. Apologies for the gap in blogging this week, I've had a bit of a mini-holiday up in Blackpool over the past few days to sample the delights that the North of England has to offer, and there most certainly was plenty of decent stuff to see! I shall post further on the various bits and bobs of interest in the coming days, but for now I shall re-unite you with a couple of lost friends. Can you tell what it is yet!? A shot of the bus in question along with a similarly liveried Asda truck! This, under her new very stylish green livery for the Asda shopper bus is our old friend, K110 SFJ, who is now owned by the Halifax Joint Committee. 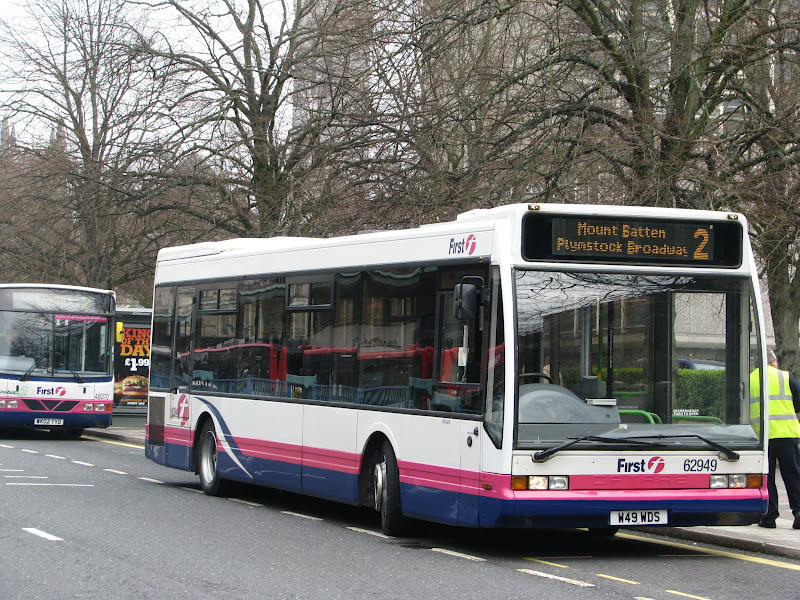 They also own L126 YOD which is pictured below and used as the spare for this contract. 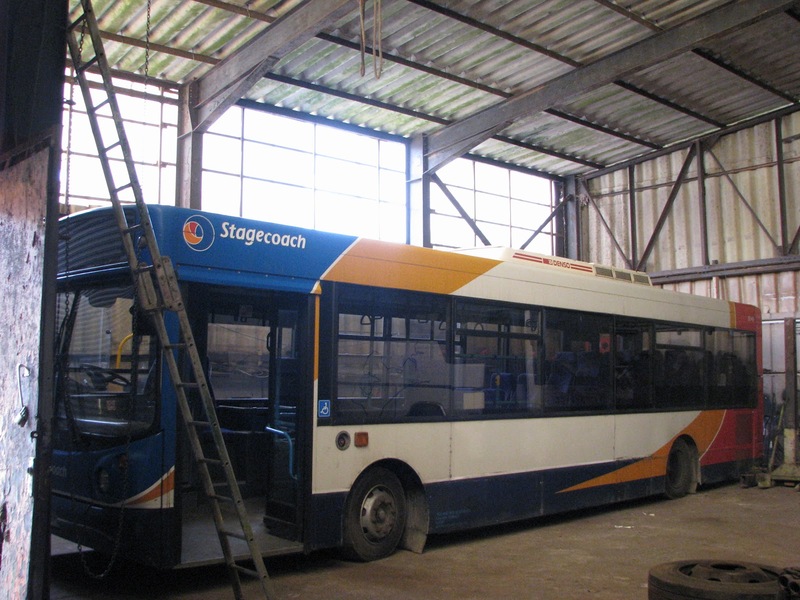 Unfortuantely, HJC no longer operate any public services, so sampling their wonderful fleet of Olympians and MCW Metrobus', not to mention a number of step entrance Darts was impossible. What I really must commend though was the quite frankly stunningly good customer service operated at Halifax bus station. 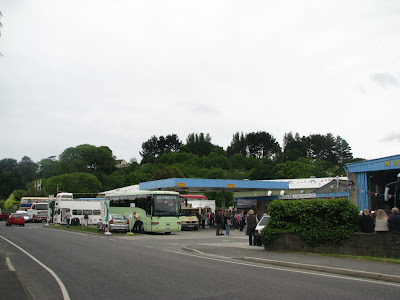 The man who was on the help desk was able to give me every last detail about the services they had lost, and who they were now operated by, as well as telling me about the 1 service they did still operate in another town, and how I could get there using connecting services etc etc. He also aided me in being able to locate the depot, and working out which services to use to be able to get there. His knowledge and friendliness was truly outstanding, I just wish I'd taken down his name so that I could let his employers know! As I'm sure many of you will know first hand, the way we get treated as enthusiasts varies wildly, and indeed I did incur one particularly bad experience over the few days which I will undoubtedly come onto in a later post, but its people like this that really make the hobby so much more enjoyable, and accessible, a true rose among what unfortunately are many thorns within the industry! 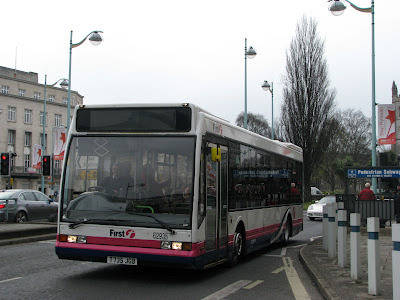 That said 'down here' generally we do have a wonderful bunch of companies who are more than willing to aid us in our hobby, particularly Plymouth Citybus as of late, but also A-Line Coaches who have been truly wonderful to myself and other enthusiasts over the years. Anyway, back to the point of the post, here is the photo of L126 YOD in which is pretty much the PCB livery she left us in, but with the red painted over in green. K110 however looks very well cared for, and the livery really is very smart indeed! The buses certainly look set to be well looked after in the near future. Roselyn continue their commitment to their hard working members of the fleet, announcing the newest member with this accolade, Volvo B10M 237 AJB originally registered E44 SAF. E44 was brand new to Roselyn way back in 1988, and yet 24 years on we still see her in daily use with the company. In fact I photographed her just yesterday, operating the regular Plymouth Service, but is also is often seen operating trips for football supporters to Plymouth Argyle on match weekends. And yet even though she's 24, that timeless Van Hool bodywork, and a bit of TLC has kept her looking young and fresh, another fine example of a Van Hool bodied vehicle that completely masks her real age. 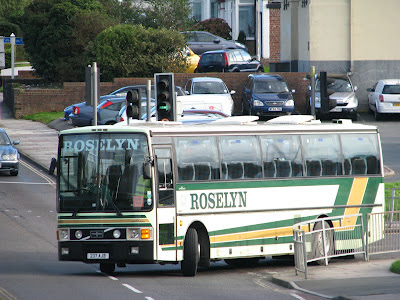 I've always admired Roselyn in the fact that they will keep a vehicle going past their usual 'sell by date' to particularly please a driver than enjoys a particular bus, as was the case with one of the TTT-X Ex Plymouth Citybus Leyland Atlanteans which still ran with the company until very recently, E44 being another great example of this commitment to their employees. I've been a fan off E44 for many years, and yet infuriatingly, she's always managed to allude me every time I have a slim possibility of riding on her, but hopefully, not anymore! Not come May 6th, where Roselyn will again open their doors to enthusiasts for their open day, the first of which was held 2 years ago. 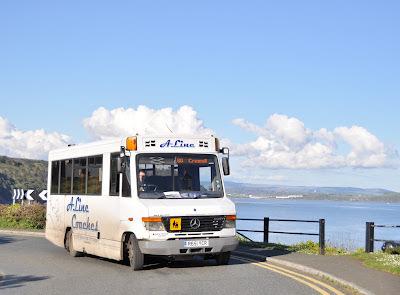 They will once again be offering open top tours of the area, quite possibly using their own open top vehicle this year rather than ones hired in from Chepstow Classic Buses, as well as other tours using classic buses and coaches. They'll also have a band their once again which was certainly an interesting and quite possibly unique feature for a bus rally, also supplied in 2010. E44 will undoubtedly be there alongside the rest of the preserved fleet including a Beford VAL, Bristol VR and Bristol Lodekka. 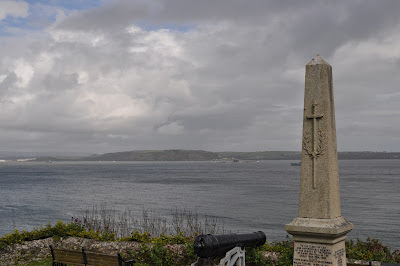 But first to come is the annual Penzance Running Day next Sunday organised by the Cornwall Bus Preservation Group which I'll do a full post to remind you about later on next week. You may well have noticed a distinct lack of Volvo B7s on First routes over the last week. This, as you may have already guessed, is because they are no longer based in Plymouth. 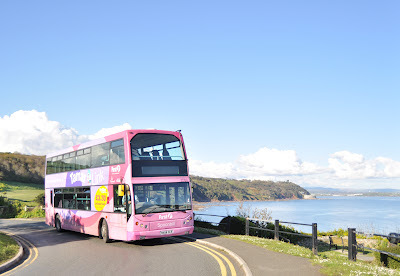 Swansea has managed to gain 4 of 'our' B7s, numbered 69249-52 although for some reason 69253 has managed to stay put, meaning after all those B7s that were once in use in Plymouth during the big Ugobus push during Phase 3, we are now left with just 1. So, what's replaced them. Well this is where the Optare Excels that were destined for Cornwall come in. More R reg Darts as well as a few step entranced Darts were able to be sourced for the new work in Cornwall, and therefore 4 of the Excels have stayed put in Plymouth for the time being. Infact I don't really know why I'm being so cold towards the Excel; in actual fact, I'm really quite a fan. The Excel has always has quite a strong following of enthusiasts, with an entire site devoted to their movement and workings (http://sulzerpower.com/excel/), and rightly so! Early Optares, both the Spectra and the Excel have always just had something about them that make them interesting, and pleasurable to the enthusiast. The body of them is certainly very good looking, very striking, with lovely clean lines, a very good piece of design, although I'm sure operators will probably tell you it comes at a price, with rot being a bit of a problem if you're not careful. Secondly, the engines are certainly quite punchy, and do really sound quite interesting, especially considering their relatively young age. This does of course depend on which engine the Excel is fitted with, although personally I've even found the Cummins engined ones to sound interesting, even though these are slightly underpowered. 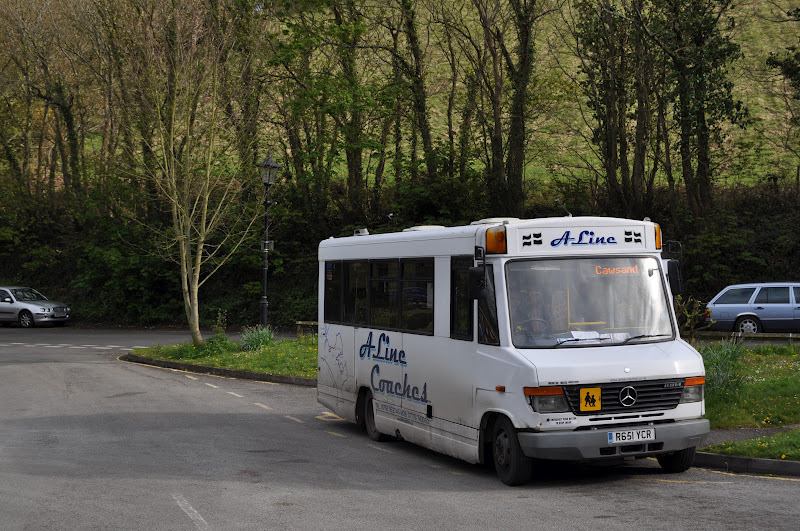 The other engine option for the Excel came from Mercedes, and quite frankly, you cannot get much better than this in a modern bus. 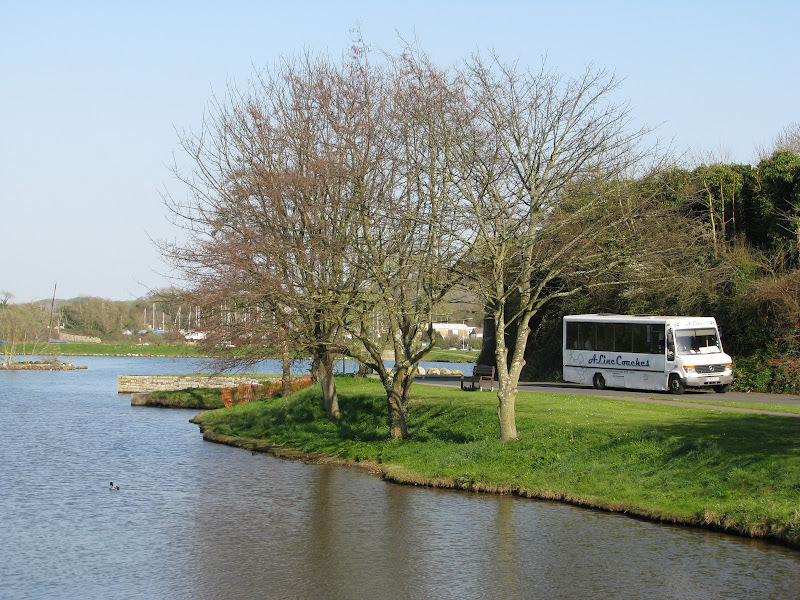 Genuinely, the power, and comfort can only be matched by a Citaro, if at all by a modern low floor vehicle. They are quite frankly sublime, and I don't say that lightly. I believe all the vehicles that FDC have inherited from Glasgow are indeed Cummins powered, but I'd certainly say don't let that put you off sampling them. 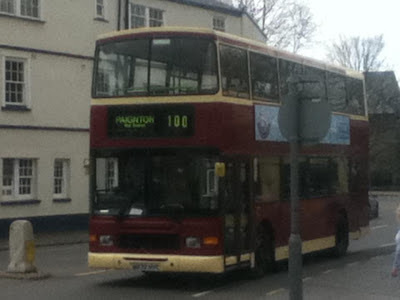 The one I rode on today, W49 WDS, although somewhat tatty interior wise, wasn't bad at all, although certainly not the nicest Excel I've ever been on. 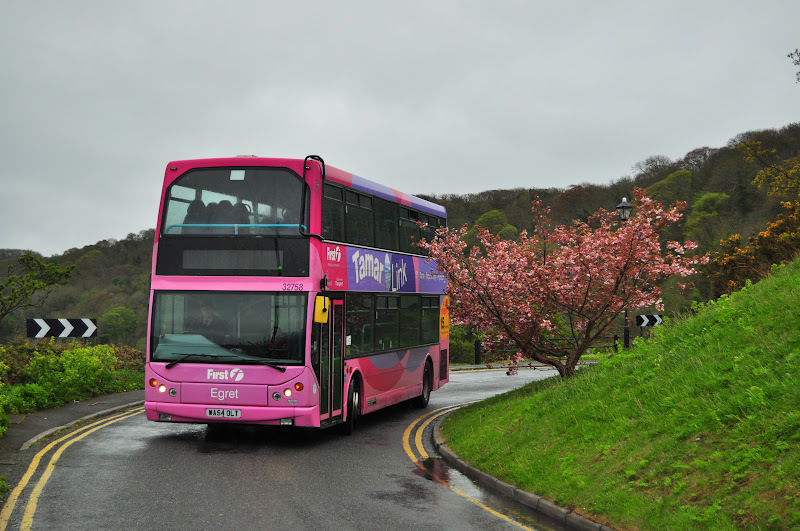 The other one out today was T375 JGB, but expect more to follow them into service over the next couple of days. The other feature I do particularly like about the Excel is the sideways seating on the rear wheelarches! Its such a simple thing, and yet I always find it completely changes to the feel of the bus. Not only is there plenty of room for a group of people to sit and talk without jabbing each others feet into one another every few minutes, but it always seems to open up the bus and feel a lot more airy and suspicious. So yes, although some 8 years older than the B7s, I certainly wouldn't knock them too fast if I were you, I reckon they're quite a catch! And when was a bit of variety ever a bad thing, even if you aren't a fan of the Excel! Well, I admit I was pretty doubtful when the first couple of people gave me news that K803 would return to service. Everything seemed to be against her surviving any longer after such a horrific engine malfunction without even considering her age. Sure enough though more and more reliable sources sprung up saying K803 was coming back. I still wasn't totally convinced. Surely they could find a working bus somewhere in the empire to fill her place I thought? But no, I was wrong, and here she is! K803 ORL has returned to service with First Devon and Cornwall, with a new engine stuck in her, and back operating prime routes within the city, today out on Ugobus services including the 2, 6 and 7. This brings the count for surviving K-ORLs back up to 2 of the original 4. My question to you though is, is the engine that has now been fitted to K803 the original type, or is it some old lump that was lying around? It certainly didn't quite sound the same, so I have therefore made a comparison video and posted it below, showing clips of the engine noise before and after. The turbo and gearbox make it quite hard to distinguish the difference, but the idle tickover certainly appears to be different. Possibly a ride on her would settle this dispute, but for now, the jury is out! It was unfortunate to hear that Riverlink (Rail River Link) Leyland Olympian OFS 702Y came to the end of her working life last week after many a year of hard graft working across pretty much the whole country! The old girl started off life right up north with Lothian, before ending her life right down south in Totnes. OFS unfortunately has been riddled with problems since her introduction with Riverlink, spending a large amount of time off the road. A lot of money was spent on her over the years, but none of it seemed to remedy what you would have hoped would have been a really reliable vehicle coming from such a well respected company. 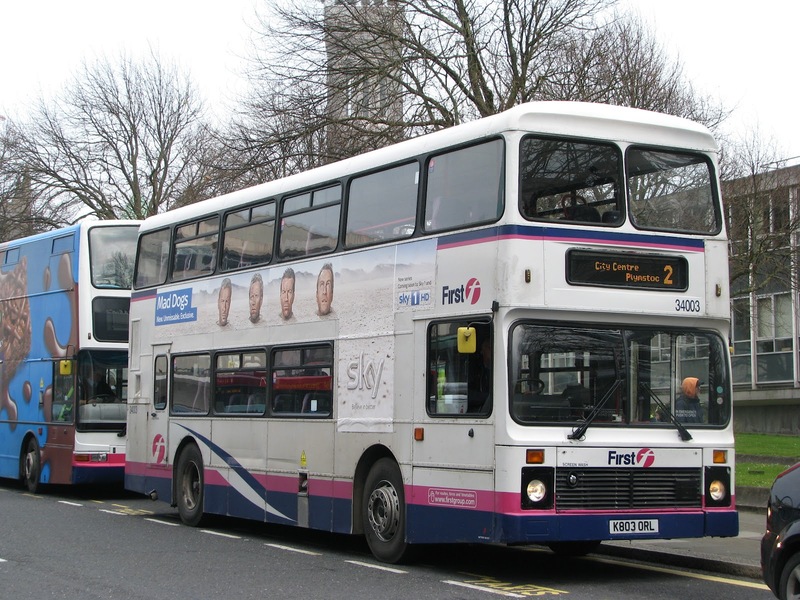 Not once did I ever actually spot her in service, I personally have absolutely no photos of this bus whatsoever! Luckily with thanks to Nicholas Morton, I am able to share this one with you, in her final weeks of operation. OFS has now been replaced by two vehicles, one being a Royale bodied Volvo Olympian M832 HVC, new as a demonstrator vehicle, and the other a K reg Northern Counties bodied Leyland Olympian, but with a Gardner fitted, rather than the usual Cummins! The Royale has been out and about already as pictured below, still her in East Yorkshire Motor Company livery, a feature which the K reg also shares at this moment in time. For your enjoyment as well I have also included a video of OFS 702Y after being converted to a semi auto gearbox rather than a fully auto, with thanks to Kameron Allan, from whom which the Royale photo also comes with from, with thanks from me. No, not Plymouth Citybus' stunning looking Volvo B7RLEs, I've already been beaten to that one! I may get round to doing a post on them if the mood takes me though. But no, today's new addition comes to us from Tamworth. A-Line Coaches has (finally!) received this fine looking ALX200 bodied Volvo B6LE, from, quite obviously, Stagecoach! 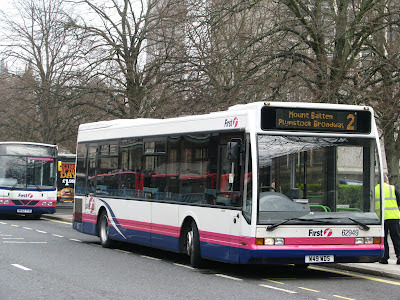 R178 NPN was new though to a Hong Kong operator, but was shipped back over to the UK in 2000. From then on she worked in and around Portsmouth on the Portsmouth - Havant corridor before then being moved up to Northampton and Rugby to work for Midland Red in 2008. The classic tell tale signs are there from her Hong Kong heritage including the large air conditioning pod, and the lovely plush coach seating which is thankfully, not leather, but proper cushioned fabric moquette! Don't get me wrong, a leather seat most certainly has a much better visual impact, as well as operational benefits, but give me a good fabric seat any day! The rest of the bus is indeed surprisingly tidy, and although the paintwork will need a bit of sprucing up to get her back into top form, its a very honest well looked after vehicle. 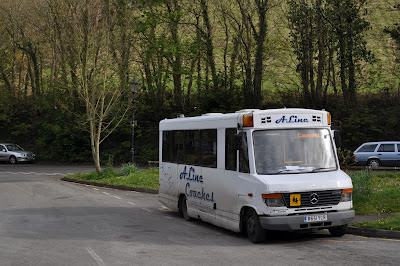 Although of course the real test will come when she hits the road on the Liskeard journeys, doing a long 14 hour day through Cornish countryside. The fired right on the button though, with the engine sounding pretty healthy, so things certainly look set for a bright future as it stands. 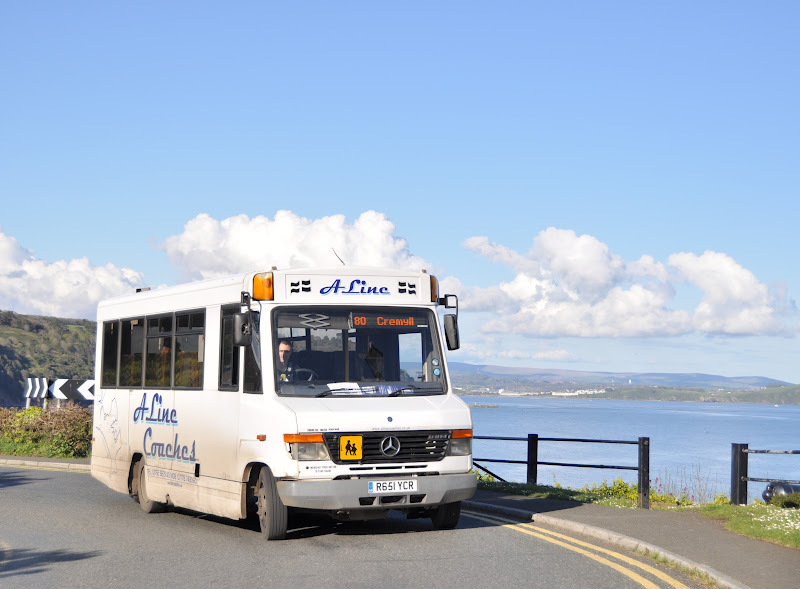 The bus is also quite momentous at A-Line in that its not only the first full size single decker the company has owned, but also that its the first low floor bus in the fleet. Both of the Varios can of course take wheelchair passengers anyway, but the low floor itself has of course got many more positive connotations along with the disabled access.